District North 24 Parganas is proud to have the birth place of the famous writer and novelist and creator of "Bande Mataram" The National song of India. Bankim Chandra was born at Naihati at Barrackpur Sub-Division of the district. Bankim Chandra Chattopadhyay - Author of Vande Mataram, the national song of India. Bankim Chandra Chattopadhyay also known as Bankim Chandra Chatterjee was one of the greatest novelists and poets of India. He is famous as author of Vande Mataram, the national song of India. 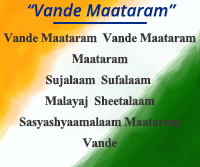 Vande Mataram became the source of inspiration for the freedom fighters all over India. Presently a Library and Research Institute exists at his birth place. The district of North 24-Parganas with its administrative headquarters at Barasat comprises five Sub-divisions viz. Barasat, Barrackpore, Bongaon, Bashirhat and Bidhannagar. The district is bounded by Nadia district in the north, South 24-Parganas in the south, Bangladesh in the east and keeps the Hooghly district, the river Hooghly and Kolkata at the west. The district of North 24-Parganas has an international border with Bangladesh in the east spreading for about 230 Km. The district with an area of 4094 sq Km, has a population of 10009781 as per 2011 census and thus shows the highest density with 2445 persons per sq. Km. among all the districts in the State. It may be mentioned that there were no existence of a district named North Twenty Four Parganas that we hear now. The district was named Twenty Four Parganas only. It was only in the year 1986 this district was carved out from the erstwhile Twenty Four Parganas district. 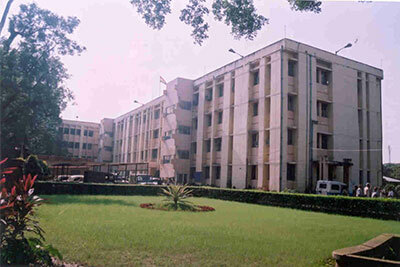 Barasat is the District Head Quarter. 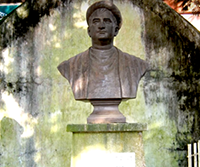 Bankim Chandra Chatterjee, the renowned Author, was the first Indian Deputy Magistrate of this town. From 1834 to 1861, Barasat was the seat of a joint-magistrate, known as "Barasat District". In 1861, the joint magistracy was abolished, and the Barasat District became a sub-division of the Twenty-four Parganas district. At present it is the district headquarters of North 24 Parganas district. At the time of British Empire, Barasat Town had gradually got its importance. British had made Barasat as their weekend relaxation place. They had made many garden house at various places within Barasat town. 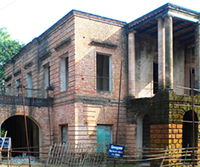 Warren Hastings had made his Villa in the heart of Barasat town. The impressive building has an imposing arched portico in front. The front wall of the building bears a stone tablet in which it is written "In this house lived Lord Warren Hastings." Warren Hastings was the first Governor-General of British India, who occupied that high position from 1773 to 1784. He established the system of civil administration that was the basis of Anglo-Indian security and prosperity. The building represents a fine specimen of colonial architecture prevalent during the 18th/19th century and was possibly used by Warren Hastings as his Garden House. Barasat town is well connected with roads to Kolkata, North Bengal, Bangladesh and other towns of West Bengal while many of these routes originates from Barasat Bus Terminal. The two nos. of National Highways (NH 34 & NH 35) and one no of State Highway (SH 2) run through Barasat town, Barasat is also well connected by railway with Sealdah, Bongaon and Basirhat. Road:- From Kolkata Barasat can be reached by two ways. Either take VIP Road (Najrul Islam Sarani) off Ultadanga (V.I.P. Crossing) to reach Airport Gate No. 1 and take right to Jessore Road (National Highway 34) or from Shyambazar via Jessore Road off Nagerbazar to reach the same Airport Gate No.1 and head straight to Barasat. Barasat is 8 kilometres straight drive from this crossing. Barasat is a major roadway junction. The NH 12 (initially under the name Krishnanagar Road) goes towards north ultimately to the North Bengal and is the major link between Calcutta and the North-East India. The Jessore Road (NH 112) leads to Bongaon and ultimately to the Bangladesh border at Petrapole. The Taki Road leads to Basirhat, Hasnabad and Taki via Berachampa. The Barrackpore Road links National Highway 112 at Barasat with Kalyani Expressway and Barrackpore. Train:- Barasat Junction is the railway station, on Bongaon line of Sealdah Station (North Section). This junction is where Bongaon line and Hasnabad-Basirhat line of Kolkata Suburban Railway get separated. The Barasat - Basirhat Railway line was originally run by Martin's Light Railways. Now it is a section (BT-HNB section) under Sealdah division of Eastern Railways. Hridaypur (Sealdah-Bongaon line) & Kazipara(Barasat-Hasnabad line) are the other railway stations under the area of Barasat Municipality. Currently a Metro railway line is under construction which is basically an extension of Kolkata Metro. Air:- Netaji Subhas Chandra Bose International Airport is about 11 kilometres from Barasat city. There are Domestic and International terminals separately for domestic and international flights towards different part of the world.